Elizabeth Downs is bounded by Uley Road in the north, Adams Road in the east, Yorktown Road and Garlick Road in the south, and Main North Road in the west. 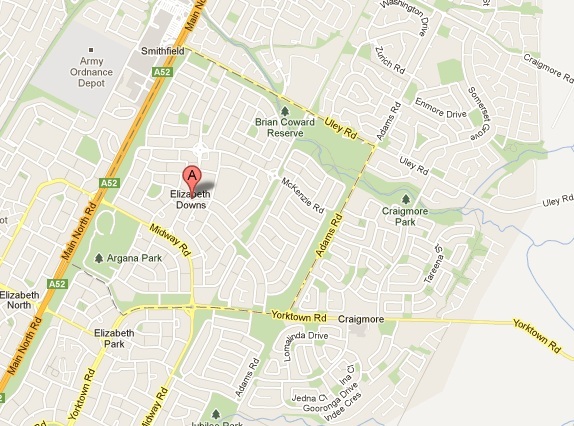 The suburb is named for an area near Elizabeth, which is named after Queen Elizabeth II. The area began development when the South Australian Housing Trust established a new town to accommodate the growth in immigration, population and industrial development in 1955. During the 1960′s and 1970′s rapid growth took place, following by a decline of population in the 1990′s due to little change in dwelling stock and a decline in the average number of persons living in each dwelling. Elizabeth Downs is an established residential area. Major features of the area include Elizabeth Downs Shopping Centre, Argana Park, Brian Coward Reserve, Dwight Reserve, Uley Reserve and two schools. The median age of people in Elizabeth Downs is 32 years with children between the ages of 0 and 14 making up 23.2% of the population, and people aged 65 years and over making up 13.7%. Of occupied private dwellings in Elizabeth Downs, 78.4% are separate houses, 19.0% are semi-detached, row or terrace houses, townhouses etc., and the suburb consists of 2.6% flats, units, apartments or other dwellings. Out of these properties, 20.5% are owned outright, 34.6% are owned with a mortgage and 40.9% are rented.